ACRA manages the Ione Pool, the Plymouth Pool, and the Sutter Creek Pool this Summer 2018. 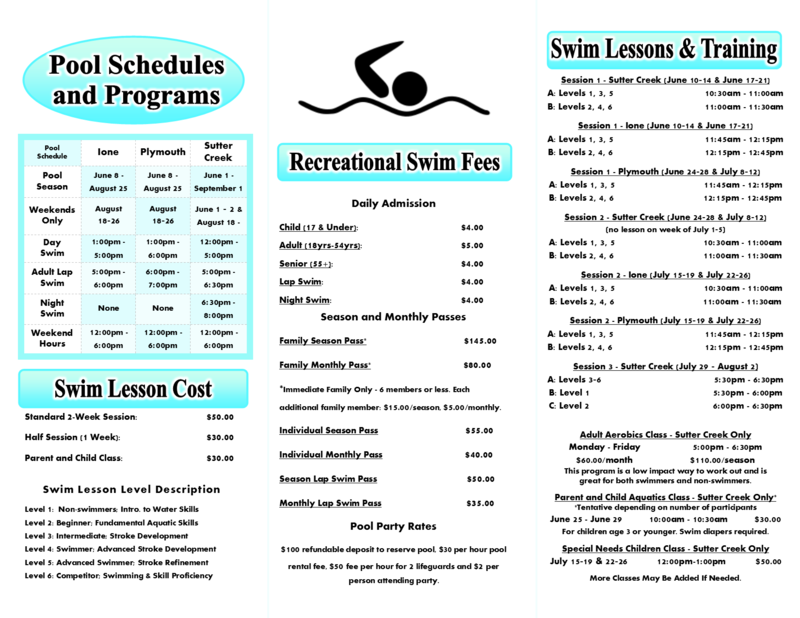 For inquiry to pool hours and lessons, please refer to "Summer 2018 ACRA Pools" below. Amador County is unique in its natural settings and beauty, with over 23 city and county owned parks. ACRA manages five of the County's more rural parks: Mollie Joyce Park, Pioneer Park, Fiddletown Park, River Pines Park, and Lion's Park. 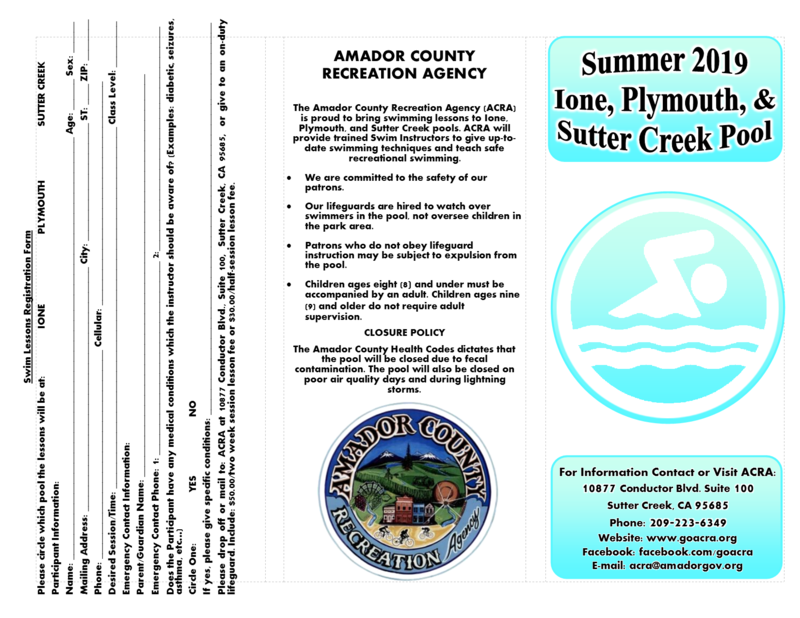 The Amador County Recreation Agency (ACRA) is proud to bring swimming lessons to Ione, Plymouth, and Sutter Creek pools. ACRA will provide Certified Swim Instructors and lifeguards to give up-to-date swimming lessons and teach safe recreational swimming. We are committed to the safety of our patrons. Our lifeguards have been hired to watch over swimmers in the pool, not oversee children in the park area. Patrons who do not obey lifeguard instruction may be subject to expulsion from the pool. Children ages 8 and under must be accompanied by an adult. Mollie Joyce Park, donated to ACRA by the Joyce Family in 2008, is located in Pioneer, California. The 76 acres contains beautiful wooded acreage with an attractive recreational facility. Veteran's Hall-with space for classes, receptions, or other events, a commercial kitchen, and restrooms. Scout Hut-with space for meetings and classes. Snack Shack-facility available for rent. River Pines Park is also known as the Erinie Dunisch Memorial Park. This neighborhood park provides this rural community a place to picnic and play.